This week, fast-food giant Taco Bell launched 'Taco Bell 2.0,' a new website that allows users to customize orders and pay online ahead of time from a computer or tablet. The new site ta.co (Sí, that's the new URL) is fun and easy to use, like the restaurant's app. The new site houses exclusive online offers, community collaboration/news feeds, and instant ordering – a feature that saves your past orders. And that's just the sour cream on the taco! The site also contains corporate information, online shopping, nutritional information, careers and locations. To learn more about ta.co, check out Nation's Restaurant News story that explores new website and Taco Bell's at home delivery initiative. It's not just the tech world the taco chain is revamping. Earlier this month, Taco Bell opened the first of many 'Cantina' branded restaurants geared toward a more urban and fast-casual crowd. The Cantina has a Fresh Look feel and offers the same great food options as the fast-food restaurants, with the addition of shareables and alcoholic beverages. And while you won’t find a drive-thru window at the new concept, you will discover a new design and more inviting, walk-up windows for your takeout orders. 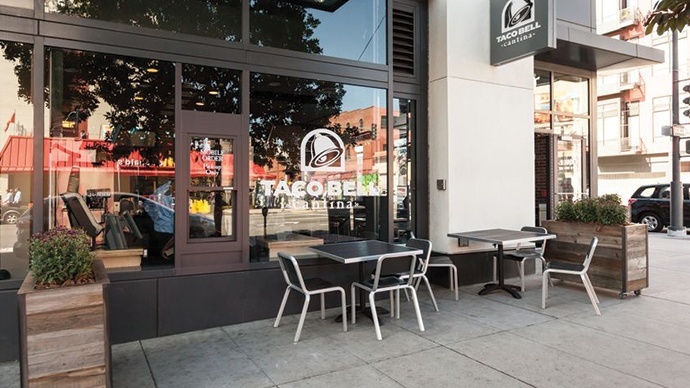 Eater San Francisco shows off its newest Taco Bell Cantina and we have to admit, we can't wait to make a run for the border!